You are here: Home / Recipes / Dessert / Ooey Gooey Turtle Brownies! 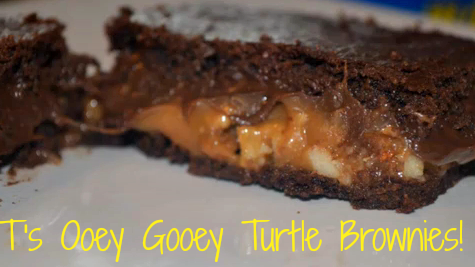 T is back with another fun recipe, today it’s Ooey Gooey Turtle Brownies! YUM! will have to try on my cheat day! i love the idea of using a cake mix, couldn’t be any easier. i’ll try this one. YUM!!! I love german chocolate, caramel, and brownies. Got to try this one. Please enter me in the giveaway! My favorite chocolate desert is chocolate cheesecake! This looks fantastic ~ I would love to make this for my father as a gift for Father’s Day! This is such a simple recipe that I ave to try it soon. This is such a delicious and easy recipe to make! I like the caramel in these brownies. Awesome recipe. Thanks! My favorite Chocolate dessert is Chocolate Lava Cake. I make these and they are so good. My favorite chocolate dessert is: chocolate lasagna!! Very easy recipe and it looks sooo delicious! Will have to make this. these look so good! i love molten lava cakes too! This looks delish! My favorite chocolate dessert as of right now is “Chocolate Lasagna” It’s a great summer time dessert! My favorite chocolate dessert is German chocolate cake, but I may have a new one !!! From your photos, your Turtle Brownies certainly look ooey-gooey-good! My best-ever chocolate dessert was a rich chocolate ganache cake, based on an Ina Garten recipe, that I once made for a friend’s birthday. So good! My favorite chocolate dessert is chocolate mousse. This recipe combines all of my favorite ingredients–what could be better?!? I love a well made chocolate covered strawberry! I love anything Turtle! These look delish! I am so on a diet or I would eat 50 of these!! My husband loves German Chocolate cake, and I am more into brownies…This is a perfect combination for both of us. my fave chocolate dessert is double fudge brownies with walnuts served warm with vanilla ice cream on top…. Wow ~ this looks so rich and delicious and not hard to make! Love this one and To Die For Chocolate Cake! my fave dessert is super chocolatey cheesecake! I love a chocolate cobbler with cherries served warm. Oh those look so good! I love that they use a cake mix! So much easier and quicker to make! Wow! I’d love to try these with my favorite scratch chocolate cake recipe! Looks super good and easy to make. And…it’s chocolate! Chocolate Oatmeal No Bake Cookies!! Turtle brownies are my fave. thanks for the awesome recipe! they look super yummy! They look amazing! Must try!